Military personnel and staff from Revolution Fitness on Moreton Hall have helped launch the Ourburystedmunds Festival of Sport which opens on Saturday (July 9) in Charter Square. 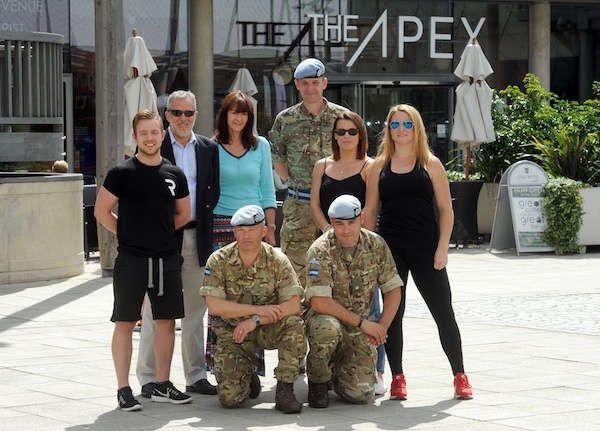 Revolution Fitness has constructed a day of events, food and entertainment at the arc shopping centre which will host a day of challenges after 6 Regiment Army Air Corps and RAF Honington teamed up with them to plan the event. It will involve physical challenges, including pulling and pushing a car across an arena, to show the level of training that military personnel undertake and help raise money for charity - as well as being a lot of fun. As well as being a big weekend on the international sporting stage with the finals of both Wimbledon and Euro 2016 there are also a number of other sporting activities locally. On Sunday the popular charity bike ride Women on Wheels sets off from Nowton Park offering routes of five, 25 and 50 miles. Close by at the Victory Sports Ground there’s Twenty20 cricket and a host of other activities and tasters in the town centre, many of them free. The Festival is organised by a partnership including Ourburystedmunds, which manages the Business Improvement District (BID), along with Abbeycroft Leisure, St Edmundsbury Borough and Suffolk County Councils and Suffolk Sport. For more information and a schedule of all the events and activities during the festival visit Ourburystedmunds.com/festivalofsport. Or to learn more about Revolution Fitness Academy go to rev-fitness.co.uk.